Over 60 some years, the farm-to-table and sea-to-table ethos has grown up. The opportunities to eat fresh, local food haven’t been this plentiful in three generations. Maine has 139 farmers’ markets and counting. 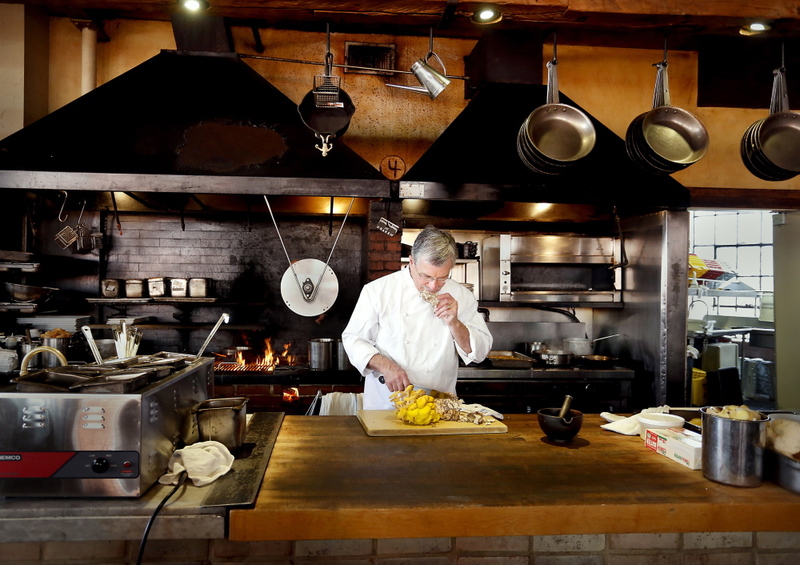 Restaurants madly vie for the title of Most Local Ever. And the choices have never been so varied. Not only can you buy local cheese or vodka, you can buy Maine-Mexican queso fresco and vodka made from western Maine potatoes. You don’t just order a Damariscotta River oyster, you order one from a specific spot on the river, say Glidden Point or Dodge Cove. On opening day of the 2013 Common Ground Fair, the state’s premiere event celebrating organic agriculture, 20,546 walked through the gates, braving Boston-like traffic to celebrate organic farming. Supermarkets sell organic milk with portraits of the actual Maine cows on the label and produce flagged with the name of the farm it came from. Maine will host a Kneading Conference this summer, drawing breadheads from around the nation. For the eighth time. How did we get here? Rod Mitchell with Jean Louis Palladin, circa 1988. Photo by Fred Maroon, courtesy of Browne Trading Co. 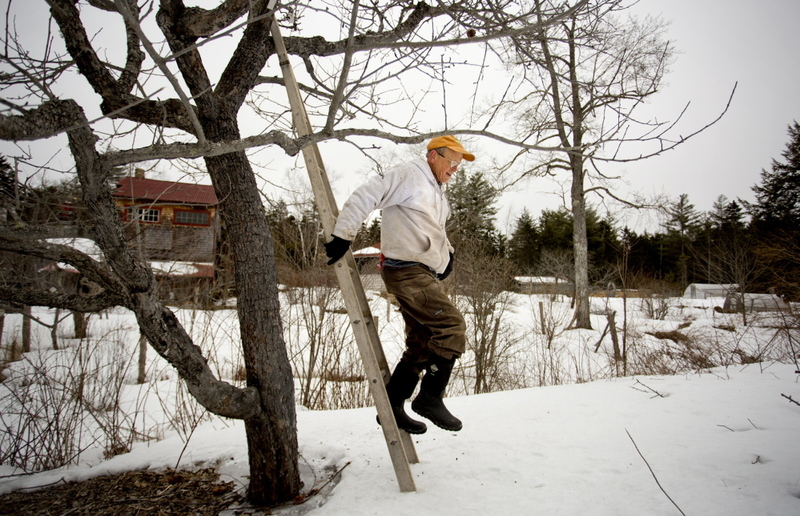 The story of the modern Maine food movement is ripe with obvious landmarks. Take the day in 1952 when radical homesteaders Scott and Helen Nearing moved their good life from a developing Vermont to less-crowded Maine. Or when Charlie Gould organized a gathering of growers who were passionate about organic at Thomas Point Beach in Brunswick in 1971, the meeting that launched the Maine Organic Farmers and Gardeners Association. Or one could point to the day in 1989 when Rod Mitchell got the bright idea to start marketing plain old crabmeat to New York chefs as “Peekytoe,” a name of quaint cunning that instigated a craving among cosmopolitan chefs for all things Maine. He’d come to Appledore Island as a hired cook at Shoals Marine Laboratory, charged with feeding teachers, students and the construction crews and engineers finishing up the lab’s new buildings. He had no formal training. His copy of Julia Child’s “Mastering the Art of French Cooking” helped with some things, if not, perhaps, the enormous cod he intended to turn into dinner. But for Hayward there it was, the food chain illustrated in bloody, fishy Technicolor. He is 65 now, remembering those days while sitting in the lounge of Fore Street, the restaurant that won him his James Beard Award in 2004 and helped turn Portland into the city the New York Times has called “one of the best places to eat in the Northeast.” Hayward is modesty incarnate – ask him if he started Maine’s farm-to-table trend at 22 Lincoln, his old restaurant in Brunswick, and he’ll say he was just in the right place at the right time, then he will name five others who were buying from local farmers and using herbs from their kitchen gardens at the time. But again and again, others point to Hayward, culturally a son of the Deep South (and the actual son of a United Methodist minister) who came to Maine from an upstate New York commune. The bond he formed in 1981 with Frank Gross, a Lisbon farmer who showed up at the door of 22 Lincoln with a basket of leeks, continues today. Gross is Hayward’s farmer and Hayward is Gross’s table. “I’ll buy anything he brings in,” Hayward said. The dots he connects on his plates are the kind that have convinced Mainers and others that fresh local foods are a necessity, not a luxury. That summer at the Shoals Marine Laboratory, Hayward stocked his larder on trips to the mainland on a Boston Whaler or by walking down to meet the fishermen from Gloucester when they arrived at Appledore, looking for a free mooring for their draggers, a decent dinner and maybe a few students to flirt with. He developed a passion for local foods that dovetailed with a national movement toward farm-to-table, the buzz phrase that has generated hundreds of worshipful books, blogs, restaurants and magazines. But back then Hayward knew the fishermen saw him as “this whack job who will take any weird thing that you bring up,” from bottom- dwelling sharks to sculpin. Forty years later, Hayward has plenty of company. Vinland, a 10-minute walk from Fore Street, serves nothing that isn’t grown or harvested in Maine; fried reindeer lichen might pop up as an appetizer. Mainers expertly toss around initials like CSA (Community Supported Agriculture) and CSF, where members get fresh fish every week instead of a box of vegetables. What’s happening at restaurants and on supper tables is innovative, but so is what’s happening in the fields. Maine is bucking national trends by attracting younger farmers. The average age of farmers nationally is 58, according to the 2012 census. But from 2007 to 2012, the number of farmers ages 34 and younger in Maine increased a whopping 40 percent, a federal census found. Farming has become hip. “Young growers have rock-star status,” said Robert Johnston Jr., founder of Johnny’s Selected Seeds in Winslow. More connectivity: Some of those beginning farmers have passed through the kitchens of chefs like Sam Hayward. (Consider that table to farm.) Maine farming may never return to its heyday in 1880, when 64,000 farms were spread across 6.6 million acres. But the state is not just adding young farmers; it is adding acreage. Eight percent more of Maine’s 19.1 million acres are farmed now than were in 2007. Numbers like these suggest Maine is headed into a future that may resemble the state’s deep past, a time when a family’s very survival depended on self-sufficiency and constant adaptation, now aided by new technologies and wisdom gleaned from two full generations of back-to-the-landers. These young farmers look to emulate the successes of Eliot Coleman, a national leader in organic farming, or John Bunker, who evolved from a curious new Colby College graduate making cider into Maine’s foremost apple expert. But they’ve also learned from the failures, the participants in what Johnston Jr. jokingly calls the early 1980s back-to-the-office movement. From all indications, the concept of eating fresh, local foods as a means to build not just bodies, but economies, has gone past trend and is here to stay. But for every number building optimism, there are daunting counterpoints. What is on offer at farmers’ markets is dazzling, but 24 percent of Maine’s schoolchildren are considered food insecure – meaning their parents don’t know where the next meal will come from. Moreover, Sam Hayward will never gut a 30-pound cod again. In 1974, fishermen landed 4 million pounds of Atlantic cod. The yearly catch grew to nearly 21.2 million pounds in 1991. As the valuable fish were overfished, the New England Fishery Management Council stepped in to reduce the pressure on the species. In 2012, Maine fisherman landed 748,130 pounds of cod, and the council again slashed their Gulf of Maine quotas, this time by 80 percent. The fish hadn’t rebounded. In the time it took Hayward to find his way to Fore Street and raise his children, one of the most reliable catches of the 20th century practically disappeared. More species will follow. “What does it mean that there is no northern shrimp out in the Gulf of Maine or no smelts coming up into Merrymeeting Bay or the Kennebec estuaries?” Hayward said. Keeping the parentage of Maine’s agricultural movement straight is tricky. Today Coleman is considered the grandfather of organic, which would make the Nearings, who gave him his start, the parents of the movement. But, before their arrival, Ezekiel Holmes, an 1824 graduate of the Medical School of Maine at Bowdoin College, had claim to the title the “Father of Maine Agriculture.” He earned this honor as the first editor of “Maine Farmer” from its founding in 1833 until his death in 1865, an era in which it was the most influential publication in the state. He was instrumental in establishing the Maine State Board of Agriculture and pushed for the agricultural experimental station that eventually became the University of Maine. And the men – along with some women – did just that, beginning in earnest in 1842 and making their way along a new road built during the 1838-1839 Aroostook War. By 1860 there were 22,000 people in Aroostook County. By 1870, it had 3,209 farms and 133,024 acres of improved land. But the numbers peaked in 1880 and, after that, the overall number of Maine farms dwindled steadily, nearly a million acres of farmland lost between 1910 and 1920, during the first World War, and by 1945 – after World War II – another million gone. In the 1954 census, there were 23,368 farms in Maine. In Maine land was cheaper. Helen, a self-proclaimed “water witch,” used a pendulum over a map of Maine to “dowse” for the right spot and found Penobscot Bay. Blueberries became their main (and Maine) crop. They were known nationally already, Scott as a sort of notorious radical, but two years after their arrival, “Living the Good Life” was published and the couple became famous. But plenty of them were certain about one thing: They wanted to live their own versions of the good life. One disciple, Eliot Coleman, arrived at Forest Farm in 1968 and bought part of the Nearing farm with his first wife, Susan. Nearly five decades later, he’s the guy food writer Mark Bittman dubbed one of “granddaddies” of the food movement. Chellie Pingree arrived in Maine as a teenager in 1971 with her future husband, Charlie, and found a copy of “Living the Good Life” on the shelf of his family cabin on North Haven. The young couple weren’t exactly disciples of the Nearings, but they used the book enough to wear its cover down. Even today, Pingree (now married to S. Donald Sussman, majority share owner of MaineToday Media, which publishes the Portland Press Herald, Kennebec Journal and Morning Sentinel) references the Nearings in speeches and when she does, she said, “three-quarters to half the room nods their heads.” She’s one of a handful of organic farmers in Congress. John Bunker became an admirer after he went to see Scott Nearing speak at Colby in the early 1970s. “I will never forget that particular evening,” Bunker said. Helen “sat next to him in a sort of a wing chair and knitted the whole time he spoke.” Years later, he had become the apple expert Helen Nearing would turn to for advice. For some, the influence of the Nearings was bittersweet. Like the Colemans, Jean Hay Bright and her first husband acquired part of Forest Farm and became homesteaders in their own right, but her idols disappointed her. The paragons of the back-to-the-land movement had electricity, running water and, worse yet, outside sources of income. Moreover, not every back-to-the-lander was influenced by the Nearings. Former MOFGA president Mort Mather, who was at the group’s first organizational meeting, hadn’t heard of them when he bought his land in York County in 1969. Plenty of people were drawn to Maine rural living because it suited their anti-war or socioeconomic beliefs. In the early days of Johnny’s Selected Seeds, those were the customers Johnston Jr. tended to encounter, people with homesteads and gardens for whom this felt like life as it should be. The Nearings may have represented a focal point for many in the back-to-the-land movement of the 1970s, an ideal to live by, but what ultimately made the difference in Maine’s circular food odyssey was what happened in communities beyond Harborside. All that youthful energy and enthusiasm built on itself, along with the passion for place John Bunker describes. Out of it came some of Maine’s most important institutions. MOFGA was and is the cornerstone. It began certifying farms as organic in 1972 (27 that year), a year before California and nearly three decades before federal standards for organic were established. The organization incorporated in 1974 and had a tiny, part-time staff, including Pingree, who used her own apprenticeship on Tony Bok’s farm in Camden that summer as a template to create MOFGA’s apprenticeship program the next summer. What MOFGA supplied in the ’70s was nothing less than the backbone of Maine’s new agricultural community. With their recipes for brown rice dishes and their disavowal of traditional basics like meat, those new back-to-the-landers didn’t always fit in. By 1976 the group realized it needed money, and the next year held the first Common Ground Fair, now legendary well beyond Maine’s borders. The Common Ground Fair was a two-fer, bringing in income for MOFGA and giving the public a chance to see – and taste – what the movement had given fruit to. MOFGA today trains young farmers in both its apprenticeship and journey person program. It is not just the oldest, but the largest state organic group in the nation, with 11,000 individual members. It was in the early days of MOFGA, in 1975, that Johnston Jr. decided to move Johnny’s Selected Seeds from New Hampshire to Maine. He bought a farm in Albion that year, where he was surrounded by homesteaders or, at minimum, people who took gardening seriously. (Nearby, in Palermo, John Bunker was already counting apple trees.) He put his energies into buying and selling seed to customers in Maine and beyond (destinies tend to collide here; on Pingree’s first farm, she raised buttercup squash for seed, which she sold to Johnston). Business was good, but Johnston watched the people around him who planned to live on $5,000 a year confronting the realities of going back to the land. He noticed how they began making compromises, like “Let’s get running water, and then get a washing machine, and then this and that.” In CR Lawn’s case, the lack of a creature comfort led to the creation of Maine’s other seed giant, Fedco. He had discovered a talent for math and began working with the Maine Federation of Co-ops in Hallowell. He made them an offer: Give him $90 a month and let him sleep in their heated warehouse, and he’d start a seed company. In that first year, they had 98 orders. Then one of MOFGA’s founders, Chaitanya York, handed him the MOFGA mailing list. “It just took off like wildfire,” Lawn said. Today Fedco has the equivalent of 30 full-time employees, mostly seasonal workers, and has been ranked in the top 10 seed companies in the United States. As the 1970s wave of back-to-the-landers were building a new food infrastructure through MOFGA, seed companies, food cooperatives and farmers’ markets, Maine chefs were beginning to bring similar ideals into their dining rooms – ideals they might not have realized they shared until they sat down to try each other’s food. Take the winter of 1979: David Grant and his then-wife, Kerlin, left Portland and drove 50 miles to South Paris in the Oxford Hills to visit Maurice, a country French restaurant founded by Parisian-born Maurice Andre. Just a few years before, Grant had been living in France, cooking for legendary chef Jean-Louis Palladin at the two-Michelin star restaurant La Table de Cordeliers. Now he was working as chef at Marcel’s in the Old Port. He’d heard good things about Maurice. The dining room was “very plain,” Grant recalled, but when he opened the menu “it looked like a menu I might have written.” The ingredients were fresh and prepared simply, a reflection of the modern style of French cooking known as nouvelle cuisine and its American cousin, California cuisine. Grant and his wife ate dinner and watched the chef, Sam Hayward, come out of the kitchen and sit at a table with Andre and some friends. After his time at the Shoals Marine Laboratory, Hayward had cooked in New Orleans for seven months and then in New York City, before returning to Maine to cook at Maurice. A waitress there owned a farm, and she supplied Hayward with fresh produce so he wouldn’t have to rely on the cases of iceberg lettuce and huge, tasteless “horse carrots” that came from local distributors. Grant had his own chef dreams. He had been kicked out of France in 1976 – he couldn’t get working papers – and he’d moved back to Maine, where his family has owned summer homes for generations. Soon after that dinner at Maurice, the Grants opened Aubergine Restaurant & Inn in Camden. Strapped for cash, the young couple raised all the restaurant’s herbs and flowers outside their back door. Grant’s philosophy was “Buy the best and do the least to it,” but he had a hard time finding anyone to supply him with produce. People started showing up with baskets of fiddleheads and berries, and soon he needed three freezers in the basement to hold the bounty. That same year a young entrepreneur named Rod Browne Mitchell opened a wine-and-cheese shop in Camden called the Winemporium. Mitchell’s Maine roots stretch all the way back to the mid-1700s and include a long line of fishermen who caught sturgeon, shad, salmon, herring, smelts and striped bass in the Kennebec River and shipped it off in wagons to be sold in Boston. As a youth, Mitchell had often helped his grandfather dig clams and net pogies, and watched his grandmother use a hammer on the porch to crack open the Maine “picked toe” crabs (so called because their pointed claws turn inward) that came in with the family’s lobster catch. She kept a constant supply in the refrigerator for crab rolls. His love of fishing led him to study marine biology in college, but the Camden store took him in a different direction. On a fateful day in the early 1980s, David Grant introduced Mitchell to Jean-Louis Palladin. The French chef had been in Vermont at a tennis camp and had swung by Camden to visit Grant, the very person who had taught him to play. Palladin and Mitchell became “thick as thieves,” Grant recalled, with Palladin seeking out fresh Maine ingredients to elevate the dishes he was serving at Restaurant Jean-Louis at Washington, D.C.’s Watergate Hotel. 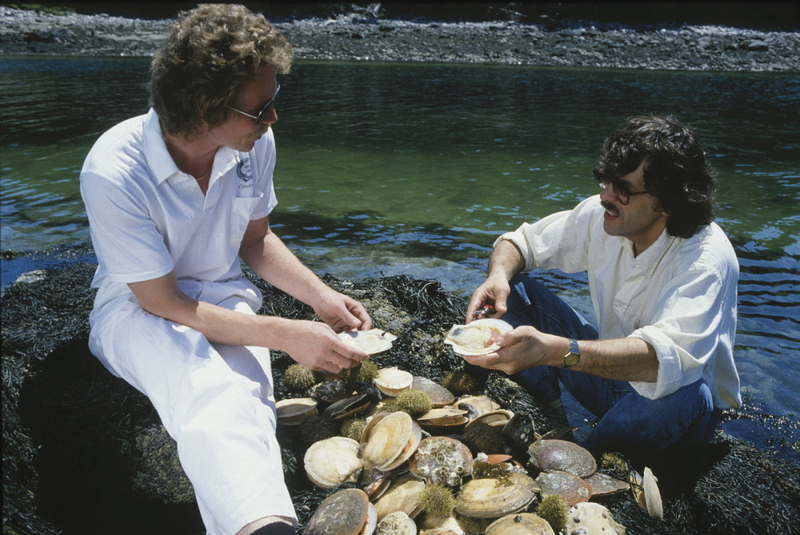 Palladin introduced Mitchell to Iranian caviar merchants, and Mitchell taught Palladin about elvers, diver scallops, sea urchins and lamprey. Word spread quickly to Palladin’s chef pals – Daniel Boulud, Eric Ripert, Emeril Lagasse and Wolfgang Puck – who soon started sourcing seafood from Mitchell themselves. In 1989, Mitchell came up with a bit of marketing magic. Inspired by memories of his grandmother picking crabmeat, he renamed the creature “peekytoe” and started selling this previously unwanted crabmeat to the country’s top chefs, all friends of Palladin, who had become the “Pied Piper” of Maine specialty seafood. Mitchell parlayed those relationships into a full-blown business known as Browne Trading Co., which he founded in 1991. Manhattan chefs Boulud and Ripert – Boulud with his elegant restaurant empire, Ripert at Le Bernardin, a place many consider the finest fish restaurant in America – remain two of his biggest customers. If Appledore Island gave Sam Hayward his first “aha” moment, then the second one came when he opened the door of 22 Lincoln, the Brunswick restaurant he bought in 1981, and saw Lisbon farmer Frank Gross standing there with a basket of herbs and 2-foot-long leeks, more white than green. Hayward had already developed a deep respect for raw ingredients on Appledore and in New Orleans, where it pained him to see cases of farmed brown trout sitting in front of a restaurant’s door, warm to the touch, flies buzzing around. Gross was the first farmer Hayward met who held root vegetables over to spring, letting them sweeten under the snow. Gross, who doubled as a dishwasher in the winter to pay for farm equipment like heated greenhouses, was also growing oddities like scorzonera, a key vegetable in transalpine Italy and the British Isles that soon became a seasonal staple in Hayward’s kitchen. It was just the kind of addition to the menu that Hayward searches for, something his diners have never heard of, but that adapts perfectly to Maine’s climate and soil conditions. He uses the word terroir, a French descriptor for the hard-to-define elements that link a wine to the land it came from. Hayward’s canon of local food sources is legendary. Lee Straw, a sheep farmer from Newcastle, called Hayward in the late 1980s to offer him lamb born on an island in Penobscot Bay from 200-year-old stock that graze on kelp. Years later, “island lamb” became a signature dish at Fore Street. Customers who have tried it swear they can taste a hint of the salty bay spray. The 1980s also marked an important shift in Hayward’s thinking, when the former musician began repeating the refrain “Let the ingredients sing in their own voices.” His French-inspired fare started showing the influences of New England and Canadian traditions, and he began to dramatically simplify his plates. This paralleled a farm-to-table movement that was budding all over America, and translated into a style that was New England-on-a-plate: Rustic fare with attention to quality and craftsmanship. A few key food writers heard about what Hayward was doing. In one week the Boston Globe ran a glowing review of 22 Lincoln and a feature on Hayward’s relationship with Gross. Suddenly the restaurant was filled on weekends with people from Boston and New York. The Vinyard closed by 1984, but other restaurants were opening that carried on the fresh, local theme. Jim Ledue, who died in 2009, insisted on buying local, first at The Good Egg, which opened in 1981 and served free-range eggs and bacon cut from slabs bought directly from the farmer, and later at Alberta’s, a popular café with a bohemian vibe that served rabbit tenderloins. “It was farm-to-table, but it was more about making things from scratch and getting real food,” said Mary Paine, Ledue’s sister, who owns Portland’s Pepperclub. By the mid-’80s, it was no longer remarkable that a restaurant would serve at least some local foods, Hayward said. Chefs educated farmers about what they needed, and they mentored young cooks. Jenkins has watched Hayward gently decline a batch of greens from a young farmer who turned up at his door at Fore Street, and then go on to explain exactly what the farmer needed to do, step by step, to bring them up to the restaurant’s standards. Jenkins grew up in Camden, where her parents had a big vegetable garden, made their own cider and relished cultured butter and thick slabs of farm-raised pork belly. There was a sense of being connected to the land, even among people who didn’t farm anymore. Yet even Jenkins’ mother embraced convenience foods when they came along in the late 1950s. “I remember when Swanson’s TV dinners came in, and my mother thought she’d died and gone to heaven,” Jenkins said, laughing. Today, at spring planting, farmers think about what chefs might want, and fishermen grow and harvest seafood for eaters with far more sophisticated palates. There are notable absences, like the big cod Hayward once served at Appledore or the Atlantic salmon trawled from the Gulf of Maine that he used to serve at 22 Lincoln. “That’s a heartbreak for me,” Hayward said. But from that heartbreak follows awareness of sustainability issues; today’s consumers are willing to try something bountiful like redfish, which 30 years ago they dismissed as lobster bait. Lobster remains king, with the 2013 landings of $364 million, the highest ever, but experts fear both a population crash and a shift northward because of climate change. On land, the bounty seems only to increase. In the days of Appledore and Maurice, Hayward had a limited choice of local cuts of fresh meat. At Fore Street, he buys the whole animal and uses what he likes: Russian boar, hogs, halves of beef cattle. As Hayward says, Maine doesn’t look like anyplace else, and in a sense, that’s helped make it the kind of place where a farmer in his or her 20s or a Somali immigrant longing to grow vegetables from their homeland can thrive. If Maine’s landscape had been more inviting, it might have been turned into endless acres of soybeans or corn – one of Maine’s early, most profitable crops at the turn of the 19th century. “In a way it’s the poor nature of northern New England which is an enabler for this new agriculture,” said Johnston, the founder of Johnny’s Selected Seeds. Plenty of Maine’s new young farmers have read “Living the Good Life,” but they are not strictly speaking back-to-the-landers. They start farming with the understanding that another income is needed to keep the farm alive. Maybe it’s a tech job they telecommute to, or a teaching gig with benefits. Or maybe it is hustling value-added products; business skills are key. But just as important in driving their success are the changed perceptions about what they do. The vegetable-buying public, Johnston says, likes connecting their bouquet of broccoli with a name and a face, and they have become the new farmers’ greatest cheering section. John Bunker remembers how the children of farmers were treated when he was teaching high school English in Fairfield 20 years ago. “They were all called ‘farmer’ and it was used as a completely pejorative term,” Bunker said. “They are considered heroes and heroines to many, many people,” Lawn said. When Bill Eldridge started MOO, Maine’s Own Organic in 2010, his old friend Stan Bennett of Oakhurst Dairy was skeptical of the market for organic milk. Bennett thought maybe Eldridge could get 2 to 3 percent of the market. “Now we’re at 6 percent,” Eldridge said. But while customers who help feed Maine’s booming farmers’ market economy may be willing to shell out a little more for MOO products or a lot more for raw milk at $8 a gallon, the price tags on Maine farmland are another story altogether. “People in the ’70s came up here and bought tons of acreage for $1,500 bucks or whatever, and their children now, by and large, have almost nothing relating to that kind of access to land,” says Joseph Conway, the author of a book about second-generation farmers called “Get Back, Stay Back.” This generation, he noticed, tends to lease. They are less romantic about their choices, because they have to be. “They’re not looking at a huge old farmhouse that costs so much to heat and keep up in addition to the farming commitment,” Conway said. They’ve scaled back the intensity, he added, “they’re not trying to reinvent the whole financial system, but they’re trying to use the basic functions of capitalism to do things like build community.” Capitalism, but 21st-century capitalism, where a Kickstarter campaign might get you that mill stone you need. Such an approach may not have as much counter-cultural oomph as scruffy hair, unruly beards and tie-dyed clothes, but in becoming more mainstream the new generation of back-to-the-landers may have more impact on the world than their parents did. They’ll just do it wearing a MOFGA T-shirt, Carhartts and work boots. And they’ll do it with a better understanding of the opportunities the food they grow have. Their wheat could end up in Jim Amaral’s artisanal bakery, Borealis Breads. Or their beets on David Levi’s table at Vinland. Or their tempeh in the hands of a parent eager to cook for his family using only ingredients from farms they can visit, here in Maine. But real tests may lie ahead. That’s why when the recent farm bill came up for a vote in January, U.S. Sen. Susan Collins (R-Maine) voted against it. She didn’t think Maine’s dairies, many of them small, were getting a fair shake. Pingree voted against the bill, too. While it included provisions she’d worked for, including funding for conventional farms to go organic and a program to help farmers’ markets draw lower-income customers, she objected to subsidies to corporate farms and cuts to the food stamp assistance program. In Maine, 130,374 households benefit from the Supplemental Nutrition Assistance Program; they will receive about $90 less a month under the new Farm Bill. Within that environment, some may perceive this new food movement – where a potato may arrive at a swank restaurant table proclaiming its Kennebec provenance – as both precious and elitist. No fools they, food leaders counter that with a neighborly gesture of Yankee goodwill: Chefs from some of Maine’s best restaurants donate their time, money and food to help fight childhood hunger through programs like Share Our Strength Maine. This year, when Hunters for the Hungry wanted to expand its program of encouraging sportsmen and women to donate their kills to include fish from ice derbies, the South Portland-based company Salt + Sea, which runs a weekly fish share keyed toward sustainable species, stepped up with an offer to get the fish ready for soup kitchens. And MOO Milk organic recently began donating any unsold product to Wayside Evening Soup Kitchen, the Cumberland County nonprofit. What is happening in Maine is part of a national phenomenon. All over the country, in places as seemingly unlikely as Houston or Cleveland, Americans are eating closer to the source of their food. It’s too big to qualify as a trend anymore. But will it endure? Lawn sees that as a world of potential for Maine. “Maine could again become a real breadbasket,” he said. There’s a thrill in his voice, the sound of a man seeing a long career pay off, not in dollars, but in message. Consider Maine’s food economy a jigsaw puzzle in a state of constant progress. Jim Amaral got the idea to start an artisan bakery in Maine in the early 1990s. There were only three other such bakeries in the state. Amaral wanted to use local wheat, but what little he could find was of poor quality. He went to Russell Libby, and after several twists and turns connected with a small mill in New Brunswick that was milling local wheat. Amaral started driving all over the state, encouraging farmers to grow grains. Nearly two decades later, more Maine farmers are willing to give grains a try, not just for local breads, but for the host of beer brewers making a go of it in Maine. Skowhegan’s Somerset Mill opened in 2012; no need to ship to New Brunswick anymore. To develop a grain economy, Amaral said, takes flexibility and time. The payoff, he said, lies in bread (and beer) with a story. “As we get more and more experience with local grains, we will get breads that reflect where those grains were grown.” As Hayward wants his food to tell a story, Amaral wants his bread to tell a story. And that story is one of Maine. Sifton remembers the days of packing his parents used to undergo to get ready for summer in Maine. It was Vacationland, yes, but also a culinary wasteland in the eyes of New Yorkers. The Siftons would procure exotics like salami and hams and pistachios in New York. Once in Maine, eating local meant eating seafood only. They’d visit markets like Shaw’s for white bread and cans of beans. “I had a really big kind of shift in my mindset about Maine food a couple of years ago in the middle of the winter,” Sifton remembers. He went to the Brunswick Farmers Market with his brother, who lives in Brunswick. They went home with a “gold brick” of a loaf of bread, fresh eggs, venison sausage and local butter, some it bartered for by his brother, an acupuncturist who on occasion swaps “needling” sessions for good food. He sat down to a breakfast comprised of “a single medallion of sausage, a single bright orange Topsham egg and single slice of million dollar bread.” Simple, uncomplicated food.